You’re considering a career as a professional driver. Great! You're looking at a career that offers a flexible lifestyle with great pay and benefits. Plus, professional drivers are in high demand right now. Just check out our post, How Much Does a Truck Driver Make? Being trained by professionals will ensure you start your career on the right foot. But not all professional driving schools are cut from the same cloth. Top schools not only prepare you for your driving test, but they also ensure you graduate and finish school as the skilled professional companies are looking to hire. We understand it can be hard to decide on a school when they all vary in cost, time commitment and level of education. Choosing the right school can open or close doors for your career. Mark Dech, a career consultant from Professional Transport Driver Training in Winnipeg, states that reputable accredited schools registered with the Privite Vocational Schools of Manitoba, should be the number 1 concern, then saftey, quality of training, success rate of the students, and placement per cent after the course is completed. With that said, let’s jump into those considerations, and some others, when choosing a driving school. The cost of the program should reflect the depth of training provided. If a school’s program cost seems high and the courses don’t seem too in depth, be wary. Similarly, if you see training for a low cost, like $999, that is definitely a red flag. We have all heard of people getting a degree or designation on the internet for a variety of subject areas but for the trucking industry, where safety is paramount, Ontario isn't willing to put unsafe drivers on the road. The province of Ontario recently took note of driver schools and the quality of education provided. It now requires students to study at institutions that the government licenses. Previously, in Ontario a road test was all somebody needed to pass before getting behind the wheel of a truck. Trucking students now need to spend at least 100 hours in classroom learning and behind the wheel. Cost can vary depending on the depth of courses. For example, Valley Driving School in B.C., offers courses running from 20 hours to 80 hours of training, but for its Class 1 complete training, requiring over 60 hours, it costs around $3,700. Professional Transport Driver Training School in Manitoba charges $8400 for a 240-hour course over a 6 week period. Top schools can cost as much as $10,000. But the choice is often up to the student for how much they want to gain. Some programs are offered on a course-by-course basis and other are offered as a packaged course load. Cost should reflect the level of training provided, so the higher the price, the more likely you are to graduate with a professional-level skillset. Funding through various programs across Canada can also help with all or some of the cost of training. Make sure to look into those options in your region. As mentioned above, the length of a program should reflect the cost. It’s best to spend lots of time practicing and working with instructors to gain a professional skillset. Consider the price of the program compared to the hours of training. Top schools usually run for 12 weeks. 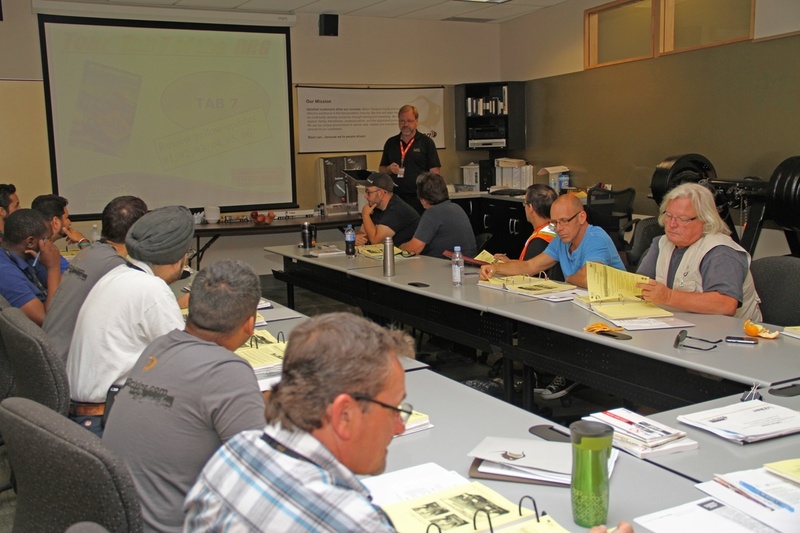 For a full-training program, classes should include in-vehicle, in-class, and air-brake training. When you’re learning about an industry that requires a considerable emphasis on safety, you need a professional with a solid track record. Instructors set you up with the habits that get you hired. Top schools hire industry professionals, so students learn from experienced drivers. Instructor-student ratio is another important factor. If your instructor is juggling multiple students during in-vehicle training, you might not get the guidance you need. In-class instructor-student ratios can be larger. You should expect a combination of individual, small group, and classroom settings. Have you heard of the new ELD mandate? (It’s OK if you haven’t because you can click here to learn all about it.) The U.S. implemented the ELD mandate, but its effects rippled through Canada as many companies switched their drivers from using paper logs to electronic ones. Schools should be updating the curriculum to accommodate changes like the ELD mandate. An updated curriculum ensures students graduate with a modern knowledge of the industry. Top schools have likely been teaching about ELDs for several years. Your school should offer a variety of different classes to help prepare you for challenges. Examples of this are Valley Driving School’s evasive manoeuvers class, where students learn to handle practical skills such as sudden stops. Look for programs that prepare you for your career. You’ll be more likely to find the right opportunity after graduation if you have a good variety of practical training. A good school can tell you the number of students who graduate and the percentage of employed graduates if they’re not already on the school’s website. If the percentage is high, most students graduate the program or are working in the field. If it’s low, students either dropout, fail to meet the requirements to graduate, or haven't been hired. Schools with good relationships with the top carriers in Canada will often advertise them on the website. Transport Training Centres of Canada has almost 100 recommendations from hiring companies. Not mastering mountain driving the way you’d like? Most schools offer refresher courses, and some provide free classes to recent grads. You can give them a call and hop back into that training truck with an instructor. You now know the most important factors when considering a professional driving school. There is a lot to consider, but what’s most important is that you graduate with a set of professional-level skills that will get you hired to start your career.